Mylo Xyloto is the fifth studio album by Coldplay which was released on October 24, 2011 worldwide. The album has enjoyed enormous success topping world charts in thirty-four countries. On July 10, 2012, the band announced that they will be co-producing a six-part comic book that will feature a “silencer” named Mylo Xyloto and his exploits in the war against sound and colour in the world of Silencia. Just this month, specifically on October 8, 2012, Coldplay released online the video of their latest song, Hurts Like Heaven which showcases excerpts from the comic book series in an animated short video. Originally, the comic book was supposed to be an animated film, but due to time restrictions, the band decided to just release an illustrated version. And to make this a reality, Coldplay collaborated with several artists including Mark Osborne (director of the 1st Kung Fu Panda Movie) will write the comic, script writer Dylan Haggerty, colorist Steve Hamaker and of course the man behind the illustrations – Alejandro Fuentes. Alejandro “Alex” Fuentes is an illustrator and graphic designer born and raised in Los Angeles. Having been exposed to comic books, graffiti, art nouveau and slasher B-movies during his growing years gave Alex Fuentes that unique artistic style which allows him to shift from one style and media to another. This, along with his great love for his children and his nostalgic childhood memories has pushed him to expand his career to new heights and make a name in the design world. Samples of his artwork, including the ones we are featuring below, are posted on his website Losfokos which he also updates with news and stories of his current and upcoming projects. If you’re interested in getting the Mylo Xyloto comic series, Alex has already finished the first three issues and is currently working on the 4th issue. The 6-part comic series is scheduled to be released on February 2013 but interested parties can already pre-order through the online store found on Coldplay’s official site. So there you have it guys. If you’re a Coldplay fan and you were wondering why they named their album Mylo Xyloto, now you know. 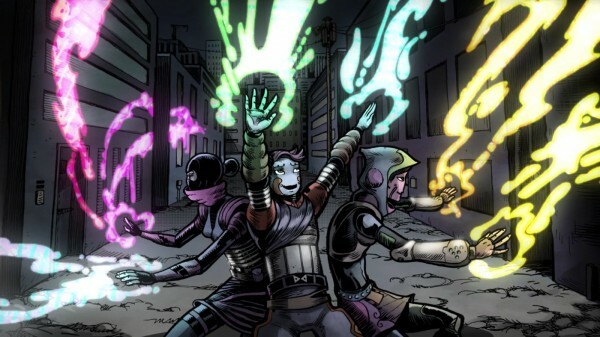 Are you marking your February 2013 calendars for the release of Mylo Xyloto the comic series? Tell us by leaving a comment below. You can also hit us up on Facebook, Twitter and Google Plus. Or better yet, subscribe to our blog for the latest and freshest design news, features and updates from all around the globe.